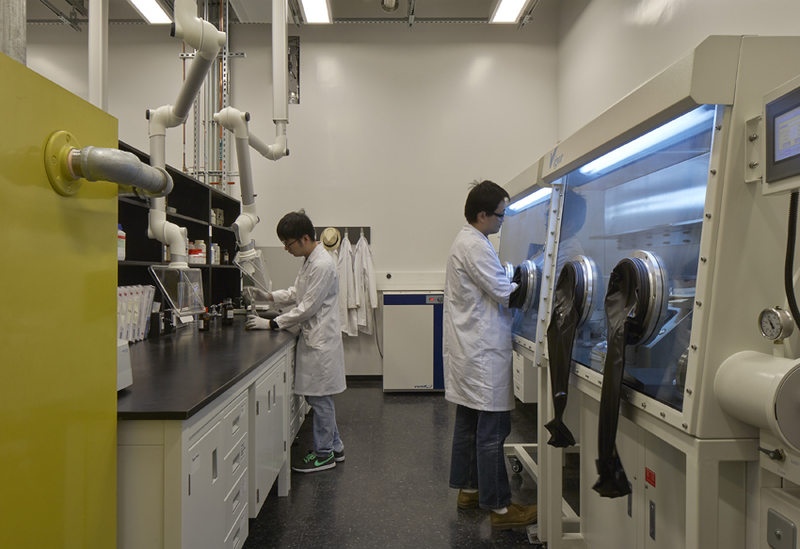 Our lab conducts cutting edge research on advanced materials, which are suitable for electronics and electrical devices. 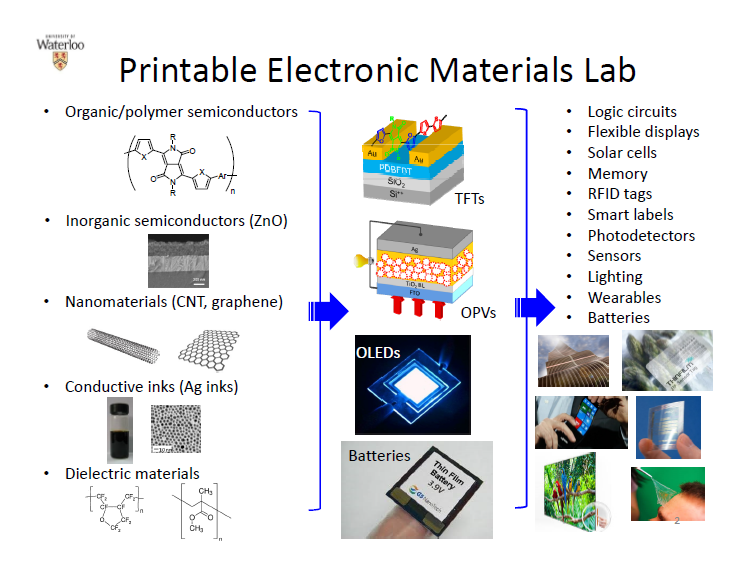 Currently we are focusing on the development of printable electronic materials including polymer semiconductors, polymer conductors, polymer binders, and various nanomaterials for thin film transistors (flexible displays, RFID tags, smart labels, sensors, and wearable electronics), photovoltaics (solar cells and photodetectors), and batteries (lithium batteries). In this study, we added a small amount of polyethylenimine (PEI) into several ambipolar and p-type polymer semiconductors and used these blends as channel materials in organic thin film transistors (OTFTs). It is found that PEI can effectively suppress hole transport characteristics while maintaining or promoting the electron transport performance. Unipolar n-channel OTFTs with electron-only transport behavior is achieved for all the polymer semiconductors chosen with 2–10 wt % PEI. The electron-rich nitrogen atoms in PEI are thought to fill the electron traps, raise the Fermi level and function as trapping sites for holes, leading to promotion of electron transport and suppression of hole transport. 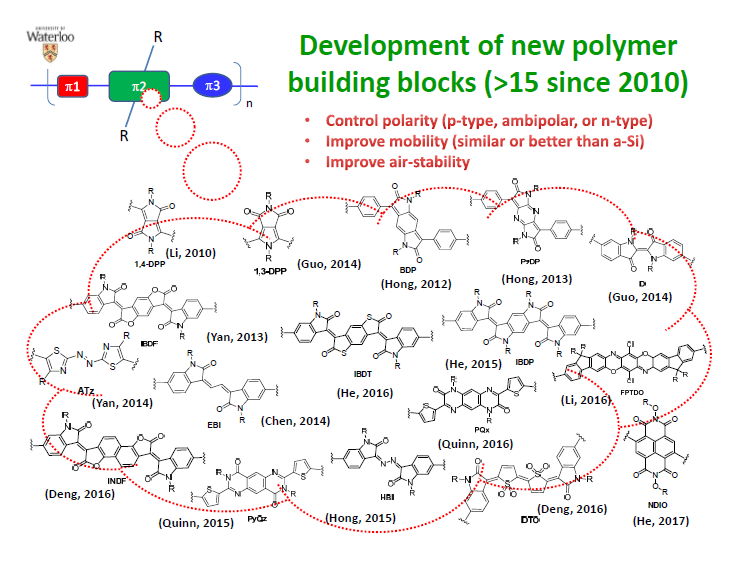 This work demonstrates a convenient general approach to transforming ambipolar and p-type polymer semiconductors into unipolar n-type polymer semiconductors that are useful for printed logic circuits and many other applications. A novel acceptor, (3E,7E)-3,7-bis(2-oxoindolin-3-ylidene)-5,7-dihydropyrrolo[2,3-f]indole-2,6(1H,3H)-dione, was reported. 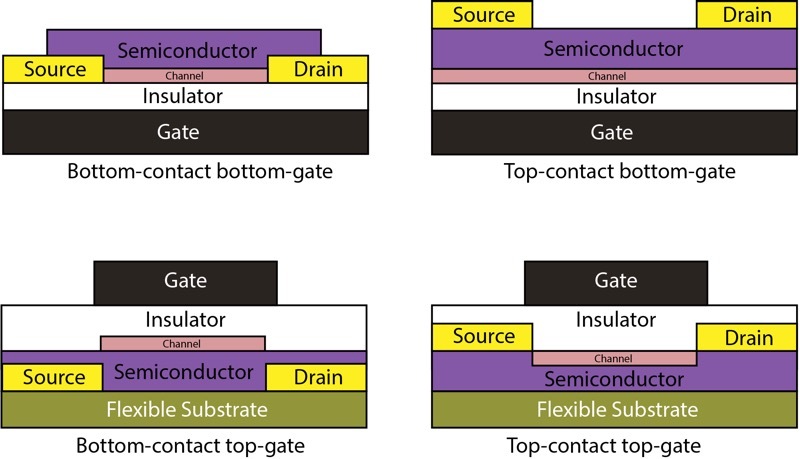 Donor–acceptor (D–A) polymer semiconductors using this new building block showed high ambipolar charge transport performance with hole and electron mobilities up to 0.19 and 0.09 cm2 V−1 s−1, respectively, in thin film transistors. A new n-type semiconducting polymer based on indigo having thermocleavable tert-butoxycarbonyl (t-Boc) groups was synthesized and used as an active layer in organic thin film transistors (OTFTs). Twisting of the polymer main chain due to the presence of the bulky t-Boc groups renders this indigo-based polymer highly soluble. A post-deposition thermal treatment at a temperature above 170 °C could remove the t-Boc groups to retrieve the highly coplanar geometry of the unsubstituted indigo units. The thermally annealed polymer semiconductor films at 200 °C showed an electron mobility of up to ∼6 × 10−3 cm2 V−1 s−1 in OTFTs, which is a 5-fold increase compared to that of the indigo-based polymers reported previously due to the retrieved high backbone coplanarity. 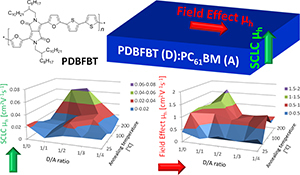 We studied the vertical and lateral charge transport characteristics of a diketopyrrolopyrrole polymer donor (D)–PC61BM acceptor (A) system by measuring the space charge limited current (SCLC) mobility and field-effect mobility respectively. It was found that with an increase in annealing temperature, the SCLC hole mobility decreased for the pure polymer (PDBFBT) but increased for the PDBFBT:PC61BM blends, which could be explained by changes in the crystallinity and crystal orientation (edge-on versus face-on). The pure PDBFBT and most blend films showed the maximum field-effect hole mobility (µh) when annealed at 100°C, which then declined as the annealing temperature was further increased. 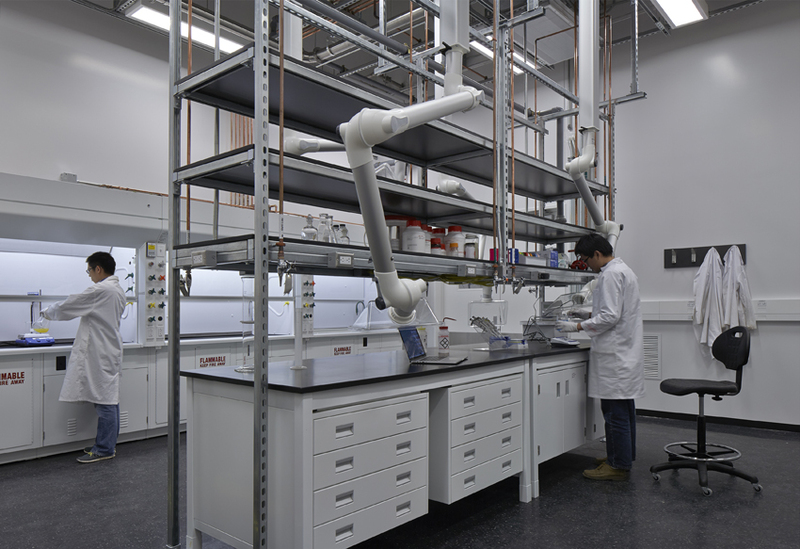 Surprisingly, the D/A = 1/1 blend films annealed at high temperatures exhibited an abrupt increase in the field-effect µh. This unusual phenomenon was interpreted by the antiplasticization effect of PC61BM, which promoted the molecular organization of the polymer. 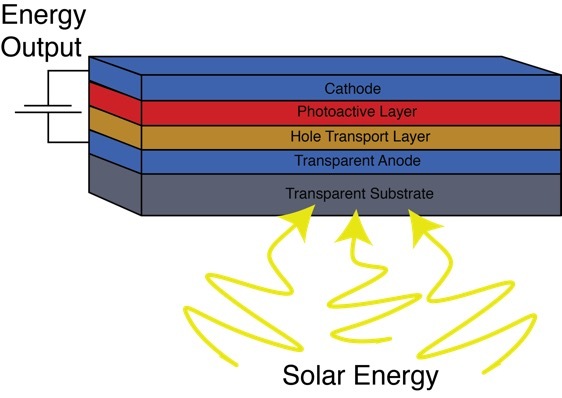 The effect of annealing on the carrier mobility was further correlated with the performance of inverted organic solar cell devices with the PDBFBT:PC61BM blend (D/A = 1/3). Thermal annealing at high temperatures (>100°C) was found to obstruct electron transport and cause the device performance to significantly deteriorate.